French President Emmanuel Macron paid tribute on Monday to the 90 people killed at the Bataclan concert hall exactly two years ago. 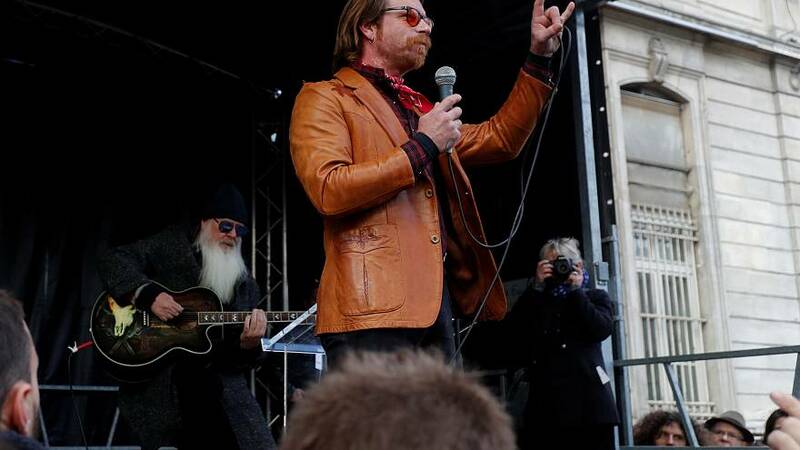 California rock band Eagles of Death Metal gave a surprise performance on a nearby Paris plaza. The band’s frontman Jesse Hughes led the crowd in a singalong of Duran Duran’s “Save a Prayer” and then sang Eagles of Death Metal’s song “I Love You All the Time” with some French lyrics. Hughes and Macron shared some kind words and a hug outside the concert hall, surrounded by family members of the victims. The group’s concert at the Bataclan theater on Nov. 13, 2015, turned into a bloodbath that left 90 dead, while 40 others were killed at Paris cafes and the national stadium. More than 350 people were wounded in the attacks. Macron and Paris Mayor Anne Hidalgo observed a minute’s silence and listened to the names of the fallen before laying a wreath at each location. The Bataclan suffered the most casualties as three gunmen stormed the concert hall and opened fire on the crowd with AK-47 rifles. During a more than two-hour long assault, the attackers executed some victims and took others hostage. The attack ended after one militant was shot dead and the two others killed themselves by detonating explosive vests.